A REAL STURDY humidor for the cigar smoker who is always on the go! After a hard day of work or play, kicking back with your favorite smoke is a great way to unwind. 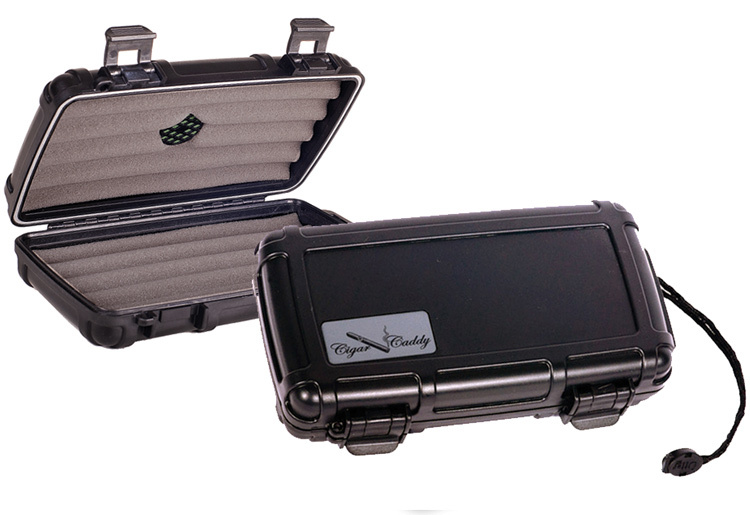 And keeping up to 5 sticks FRESH in this RUGGED Cigar Caddy 5 is just what you need. Its tough impact resistant ABS plastic exterior is built to be tossed around and features a lid with heavy duty clips to seal and keep moisture IN. The case is designed to float on water and is water resistant to accommodate "adventurous" cigar smokers who love the outdoors. The Cigar Caddy includes a humidifier and handle for convenience. To top it all off, all at a price your smoking buddies will be envious of. this is a good travel or every day at home.air tight,i put a stub out, inside,that made the humidor stink.i air it out good as new.i am happy with this cigar caddy 5 good deal.